There is an abundance of seafood in Korea because it is a peninsula, and as many of you know, Koreans are masters of preserving food whether by fermenting, drying or salting ingredients. 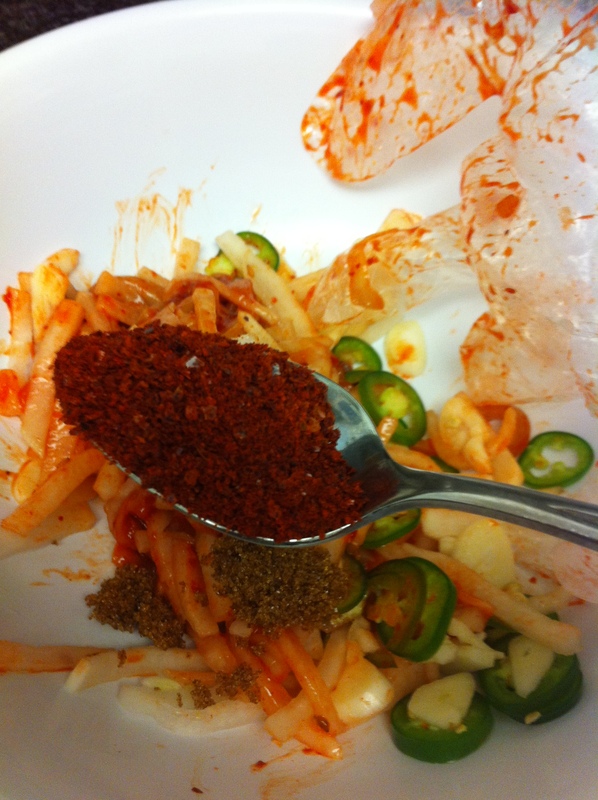 Jutgal is a term used for seafood that is salted and many times spiced, oftentimes eaten as a banchan or a side dish. 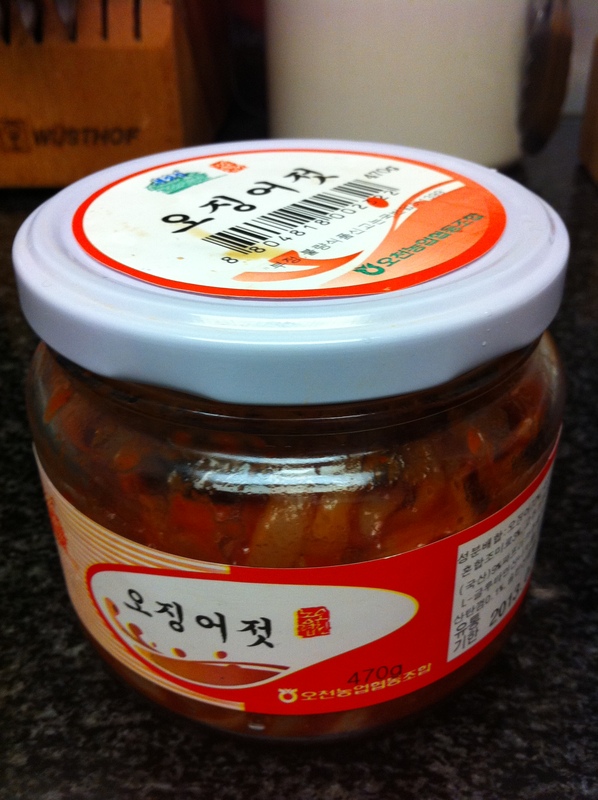 One of my favorite jutgal is made of squid, ojingau-jutgal, which can be found in any Korean grocery. It is perfectly fine to eat it with a bowl of rice the way it is, but sometimes I like to enhance the flavor profile by mixing in some moo, garlic, peppers and a few more spices. 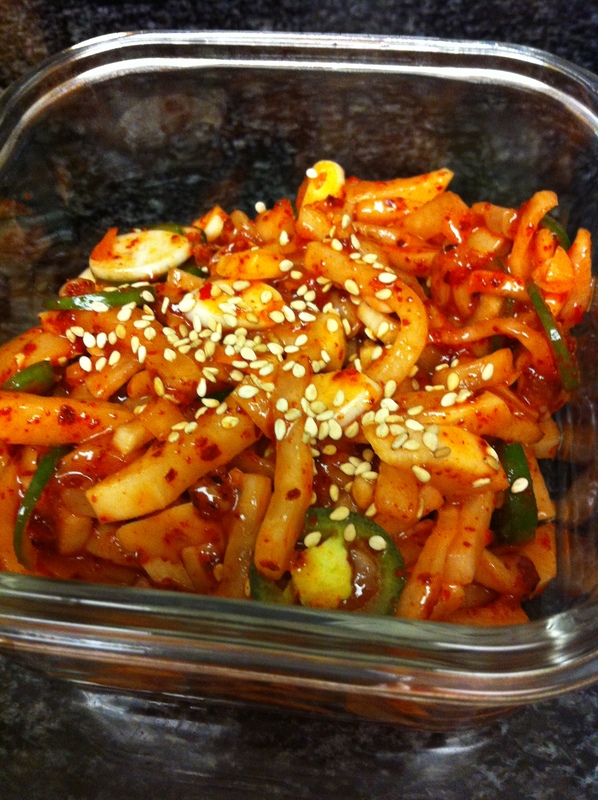 I like to eat this dish with a hot bowl of kkori-gomtang (꼬리곰탕) or sogogi-moo-guk (소고기무국) and rice. Salt the thinly julienned moo and let it sit to draw out the moisture of the vegetable for about 20 minutes. 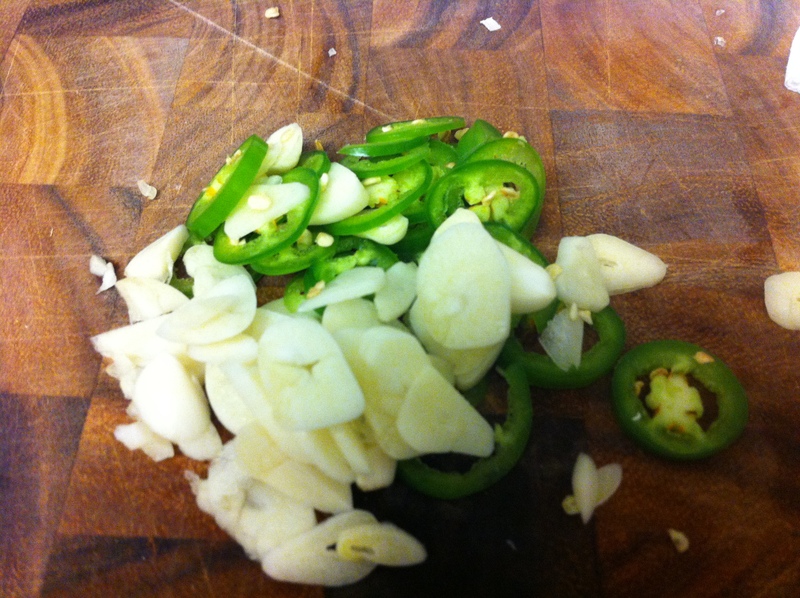 In the meantime, prepare garlic and jalapeño or serrano pepper. When the moo is ready, drain the liquid out and squeeze the remaining liquid out by pressing with a paper towel. This prevents the ojingau-jutgal–muchim from becoming watery over time. 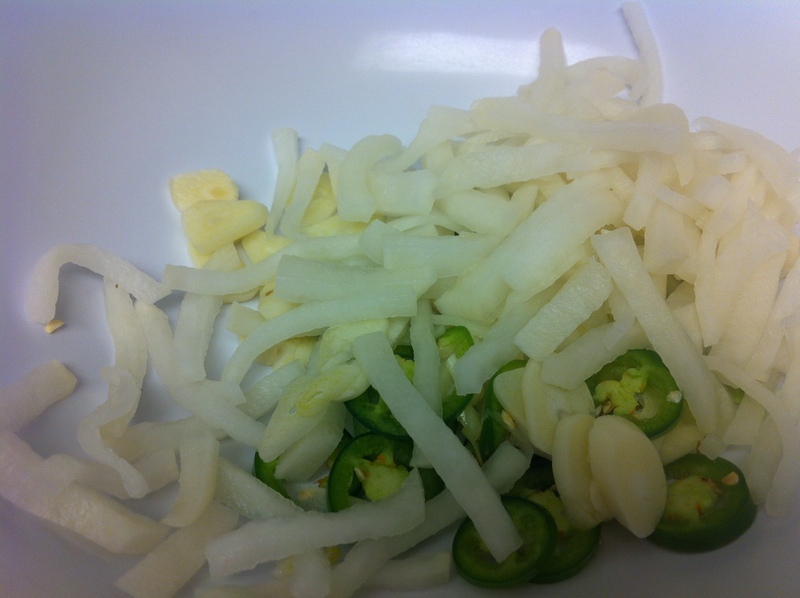 Mix all the remaining ingredients together except for the sesame oil and sesame seeds. 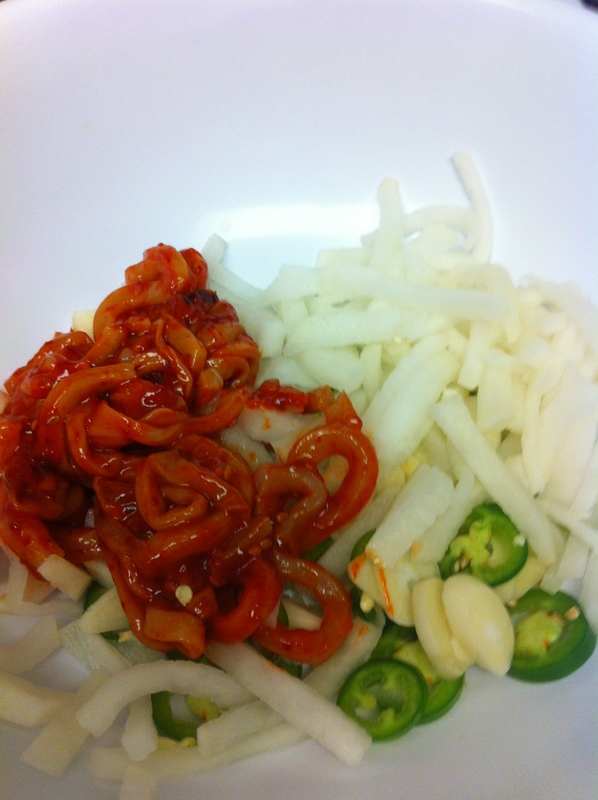 Combine the sesame oil last and garnish with a sprinkle of toasted sesame seeds. 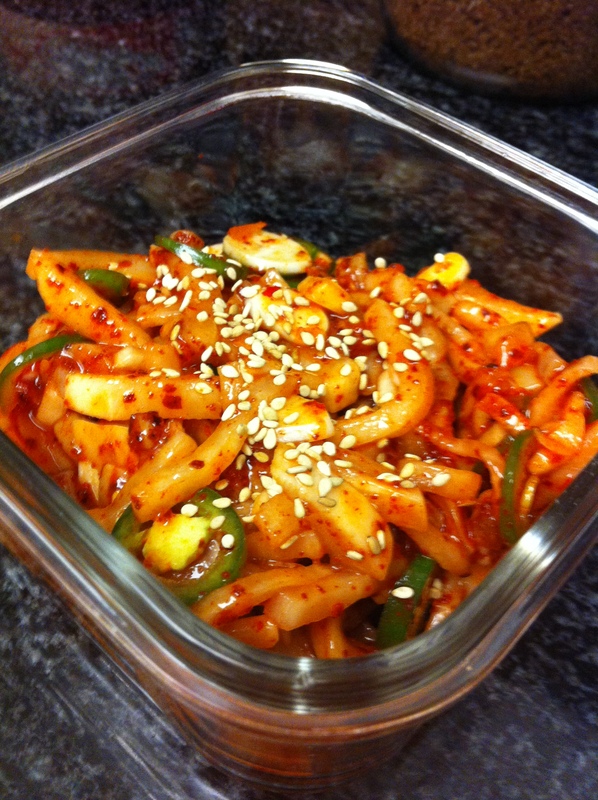 This entry was posted in Banchan (반찬, Side Dish), Seafood and tagged Squid by gangnamkitchen. Bookmark the permalink.